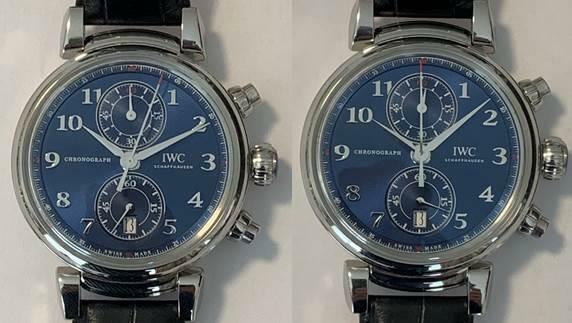 My IWC Da Vinci Chronograph Laureus (ZF) is just 1 day old and the chrono is acting oddly. If anybody has any ideas/suggestions as to what is going on and how to deal with it, I'd be very thankful! The Start/Stop pusher works, but the reset pusher results in the chrono's second hand being reset to ~2 seconds (left picture), not zero. If you repeat the act of starting, stopping, reset, the chrono's second hand will reset to ~2.2 seconds, then 2.4, 2.6, 2.8, 3.0, to where it is now, at ~3.2 seconds. The minute hand on the chrono subdial also resets to -1 minute. If you try to start the chrono, then stop it at exactly 12 o'clock, then plan on never using the chrono again, the chrono's minutes and hour functions on the top subdial keep running (right picture). I remember from a previous poster here that you should not continuously run the chrono. I googled the topic and the only solutions were for watches with quartz movements, not automatics (7750 Valjoux). Also, I just tried starting, stopping, and resetting the chronograph ~300 times so that the chrono's second hand went all the way around to 12 o'clock. Unfortunately, when the hand reached the stopping point of 59 seconds, the next reset resulted in the hand jumping to 1 second. Zero-second was skipped over. All the previous times, the second hand only advances between 0.2 and 0.5 seconds. For the final jump, it jumped 2 seconds. The top subdial still also is zeroed at -1 minute. You should really try to simplify your problem. Your methods of explanation are very confusing! When you stop the chronograph and reset it, the centre seconds hand is gradually moving further from the 12 o'clock position...Yes? If so, the hand 'probably' needs reseting. This requires lifting the hand, moving it back to the 12 o'clock position and pressing it back onto its pivot. Is the 60 minute counting hand (12 o'clock subdial) reseting to the same (- ~1 minute) position every time or is that gradually moving too? Thank you for your feedback. Here is a video that should better explain the problem. The chrono's second hand in the video starts at 8 seconds, and finishes at 13 seconds. Yes, when you stop the chronograph and reset it, the centre seconds hand is gradually moving further from the 12 o'clock position. Basically, push start, wait ~15 seconds, push stop, push reset, and the second hand resets ~1 second further away from 12 o'clock. However, when you push to stop the chronograph, the 60 minute counting hand, and the hour hand, on the 12 o'clock subdial will continue to keep running. Because of this, it prevents the makeshift solution of stopping the chrono's second hand on 12 o'clock and never using the chronograph again. For example, I stopped the chrono's second hand at 12 o'clock, then went to sleep for 7.5 hours. When I woke up, the 12 o'clock subdial's hands were at 7:30. Pushing reset, both the 12 o'clock's subdial's hands returned to -1 minute. The centre second hand is more than likely slipping, so need resetting and pressing on the pinion securely. This is a straight forward job for anyone competent working on watches. The second issue of the 60 minute counter running continuously indicates a problem that would need further investigation. This watch has a modification to move the running seconds from 9 o'clock to 6 o'clock. That means a few extra gears and I am unaware what the layout of it is. I can imagine how disappointing this is but my advice would be to get the centre seconds hand set properly and forget about the 60 minute counter. It may be more trouble than what it's worth. If the 12 subdial is 30minutes counter it should be a standard 7750 mechanism, the modification is not on the 6 o clock subdial. But it’s not a standard 7750 and to access the gears on that 12 o’clock subdial the top plate will need to be removed, under which will be all the extra extra gears that shift running seconds from 9 o’clock down to 6 o’clock.